I first visited Egypt in 1993, when we saw the Pyramids, the Cairo Museum and took a Nile cruise from Luxor to Aswan. In 1998, we took the Lake Nasser cruise to Abu Simbel, followed by a cruise from Aswan to Luxor. In 2006, our cruise ship called at Alexandria. Unfortunately, the English-speaking tour of the city was full, so … we went to see the Pyramids. And, there’s no sense of ‘been there; done that’ about it. I want to return, and take some digital video (I have analogue video, but no means to convert it, so I can share) and, inspired by a Lenhert and Landrock print I was given, do some black and white photography. While being shown around the Karnak Temple, near Luxor, in Egypt, a strange thought came to me. If, in 4000 years’ time, all that remained of our town was the church, would a 25th Century archaeologist be able to form a picture of life in our time from what was within? And, I thought of Stonehenge, near my home, which is about the same age as some of the temples. In contrast, here was our guide, who looked about fourteen years old … but must have been older, because she told us she had a university degree … talking about gods, pharaohs, priests and temple-builders like other people gossip about their neighbours. 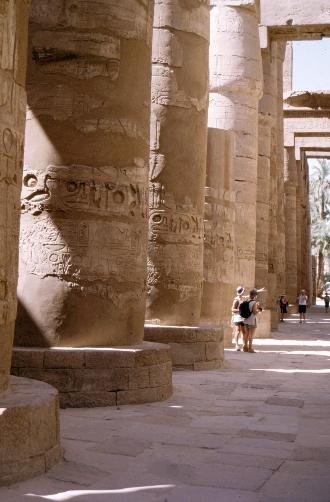 The design of Karnak, like the many other temples visited shows the importance of the river Nile. The temple layout, which was fairly standard, depicted Egypt in microcosm. The central aisle represented the Nile, the pylons, or walls on either side of the entrance, were the low hills on its banks, and the pillars in the hypostyle hall, which you’d encounter after passing the pylons, represented the trees and reeds. As worshippers approached, the aisle, like the river, became narrower, and fewer and fewer people were allowed through. Finally came the inner sanctum, where the god lived. Here, only the High Priest and the Pharaoh could enter. Those ancient Egyptian priests and builders were accomplished showmen, and, like modern tour operators, knew exactly how to extract the maximum awe and reverence from the worshipping masses. Temples were designed to be approached from the front, and most were laid out so that the image of the god the temple was dedicated to was lit by the rays of the rising sun on Midsummer Day. In exactly the same way, the midsummer sun falls on the so-called Altar Stone at Stonehenge, and on that day, you’re actually allowed into the stone circle. And, looking at the stones through half-closed eyes, maybe they’re reminiscent of the hypostyle hall of an Egyptian temple. Is that too fanciful? Or, is it possible the builders of Stonehenge tried to reproduce something they’d seen in Egypt? I spent the afternoon at http://www.slide.com learning how to assemble a slide show and put it up. So, as they say ….watch this space! Just discovered your blog and love it. You’re so right when you question what will we leave behind for future archaeologists. Certainly not as much history as we can find in Egypt! I’m doing a similar kind of travel blog for Egypt, you’re welcome to have a look. I’m just going to check out your interesting looking slide show…. Egypt has changed a lot during the years but most of the historical sites remain the same and attractive. A number of travellers take flights to Cairo each year for being at the sandy paradise. It’s tempting to think that the people who built Stonehenge might have borrowed the idea from ancient Egyptians, but the temples of Karnak were starting to be built during the 11th dynasty, that is in the 22nd century BC. Stonehenge is much older than that so…maybe it was the Egyptians who stole the idea from elsewhere! Or maybe they just came up with their ideas on their own. Hey Keith, I was looking thru my lists of travel markets and blogs and finally got to yours. Lovely blog! Well done.